One Room School House Records — What You Can Learn From Them. The online ‘One Room Schoolhouse Project’ helps to bring the one room schoolhouses of history to life on the internet with contributions by former students, teachers and residents. To illustrate the wealth of available information, Christa Kaytor will discuss her family’s research into a number of one room school districts. 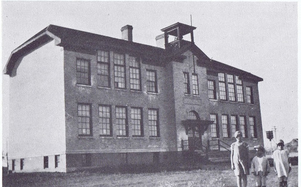 Become familiar with the one room school districts near Cadillac; Elmwood, Fairy Lake, Boule Creek, Priory, Wheatville, Crichton, Bedford, Orwell, Highway, Gouverneur, McKnight, Pinto Head, Driscol Lake, Frenchville, Lac Pelletier, Notre Dame, Cadillac. The amazing resources compiled by local residents provide a wealth of information. The online One Room Schoolhouse Project helps to bring the one room schoolhouses of history to life on the internet with contributions by former students, teachers and residents. Registration required. With a passionate ardour the speaker at the above library resource event, Christa Kaytor, has populated the One Room School House pages with the history of schools in and around Cadillac, Saskatchewan. Obtaining the prerequisite permissions to republish online the book; History of Cadillac and Surrounding District, The Good Old Days Prepared by Alta Legros and Marlene Davidson for Homecoming ’71 Elmwood, Fairy Lake, Boule Creek, Priory, Wheatville, Crichton, Bedford, Orwell, Highway, Gouverneur, McKnight, Pinto Head, Driscol Lake, Frenchville, Lac Pelletier, Notre Dame, Cadillac Saskatchewan, Canada has been a treasure for visitors world wide as they come to understand pioneer life and school days in Saskatchewan. Alta Legros and Marlene Davidson spent hours of research on the book, and traveled many miles to make this book possible. Now Christa Kaytor, descendant of Alta Legros is carrying on this fine tradition with further submissions of Westwood Valley School District 2844, Highway School District 4623 and offering to share her wealth of knowledge about the Saskatchewan One Room Schoolhouse on the prairies.